FREE APPRAISAL. To buy, auction, sell or consign your Charles Lindbergh Spirit of St Louis fabric that is for sale, please email Nate@NateDSanders.com or call the Nate D. Sanders Auction House (http://www.NateDSanders.com) office at (310) 440-2982. Please let us know if you have a Charles Lindbergh Spirit of St Louis fabric for sale. Top dollar obtained for your Charles Lindbergh Spirit of St Louis fabric. Charles Lindbergh may be most famous for completing the first transatlantic flight while solo in 1919. He also completed the first non-stop flight from New York to Paris flying the plane, the Spirit of St. Louis, which won him the Orteig Prize. Other notable achievements include working as an air mail pilot and earning several medals including the Medal of Honor and Congressional Gold Medal. Charles Lindbergh memorabilia is very popular among history and aviation collectors. We have sold fabric from the Spirit of St Louis and other Charles Lindbergh memorabilia at auction. Lot details are below. Charles Lindbergh Signed Piece of Fabric From the Spirit of St. Louis — Very Scarce Given by Lindbergh to Select Individuals on Christmas, 1928. Exceptionally rare piece of fabric from the Spirit of St. Louis, signed by the aircraft’s chaperone to Paris, Charles Lindbergh. 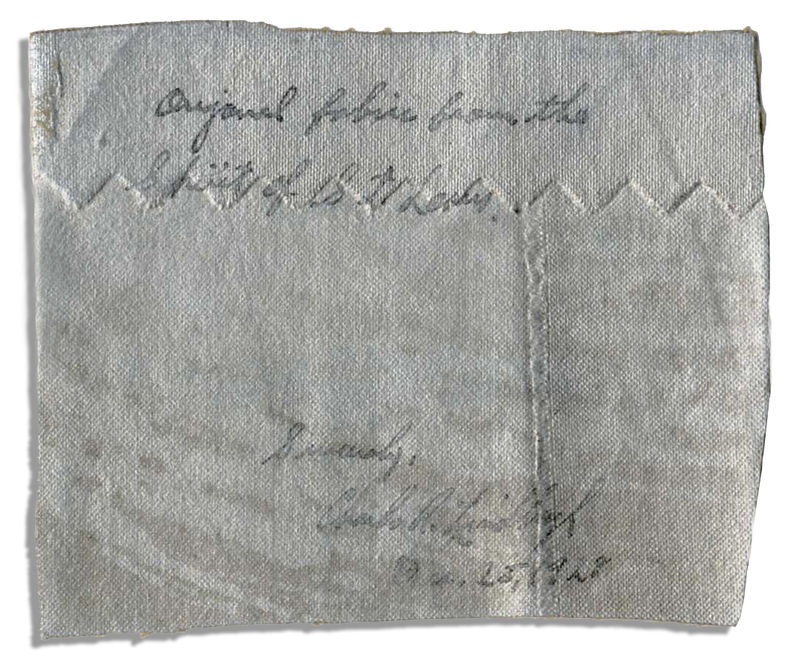 Upon the 3.25″ x 2.75″ piece of fabric, Lindbergh writes “Original fabric from the Spirit of St. Louis. Sincerely, Charles A. Lindbergh / Dec. 25, 1928”. This piece of silver, stiffened fabric was treated at the time of its manufacture, and therefore likely taken from the fuselage area of the plane. Especially made by Ryan Airlines in 1926 for Charles Lindbergh’s transatlantic flight, the Spirit of St. Louis was a highly experimental aircraft in its time, with its single-engine design, which Lindbergh believed would optimize his chance of success. As tradeoffs, however, the engine tank was situated at the front to improve the center of gravity (denying Lindbergh a front windshield) and the fuel capacity of the plane was dangerously low. Lindbergh, in fact, was so concerned with losing fuel from the weight of the plane that he trimmed excess paper from his maps. 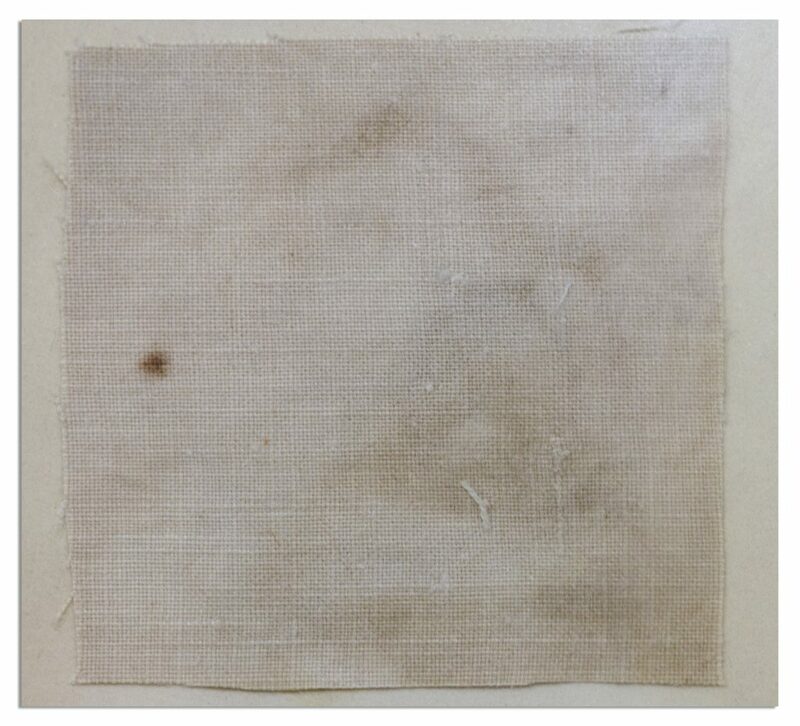 This piece of fabric from the spectacular and revolutionary aircraft was removed after Lindbergh flew The Spirit on its final flight from St. Louis to the Smithsonian Institution in Washington, D.C., in April 1928, where it still resides. There, at the Smithsonian, it was renovated and this piece of the plane’s fabric was saved and, on Christmas, 1928 signed and given to only a select few individuals close to the courageous aviator. Very good. Sold for $14,035. Charles Lindbergh Spirit of St Louis fabric signed. Click to enlarge. Charles Lindbergh Signed Piece of Fabric From the Spirit of St. Louis. Click to enlarge. Fabric from the first airplane, the Wright Flyer, which made its debut flight at Kitty Hawk on 17 December 1903. 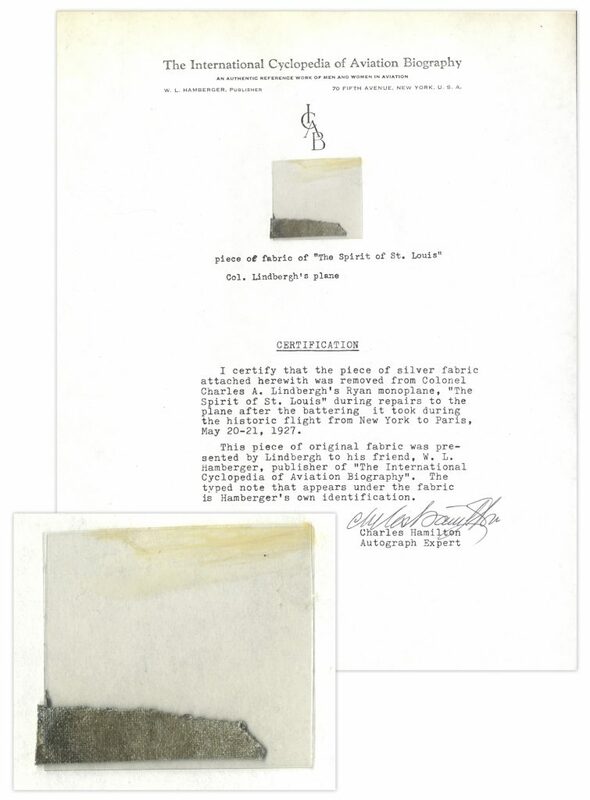 Fabric measures 1.5” square, affixed to a certificate signed by Lester D. Gardner, Editor of Aviation and Aeronautical Engineering, and close friend of Orville Wright. Certificate to Gordon P. Olley, a World War I flying ace, reads in part, ”…Orville Wright…had preserved some of the original coverings of the wing and [his executors] entrusted several pieces of this most valuable relic to me for distribution to notable aeronautical friends. I certify that this piece was used in the first successful flight in history by Orville Wright on December 17, 1903 at Kitty Hawk, N.C. [signed] Lester D. Gardner”. Certificate measures 8” x 10”, handsomely framed in gold and black to 12.25” x 15.25”. Uniform toning to certificate, else near fine condition. Sold for $12,500. Fabric Swatch From the First Airplane, the Wright Flyer. Click to enlarge. Piece of silver fabric taken from the exterior of Charles Lindbergh’s ”The Spirit of St. Louis”, the first plane to fly across the Atlantic Ocean. The legendary plane featured a fabric covering to both the wings and fuselage. Fabric is housed in small plastic pouch affixed to an LOA from Charles Hamilton typed on stationery from ”The International Cyclopedia of Aviation Biography”. The LOA states that the fabric was given by Lindbergh to W.L. Hamberger, the publisher of the Cyclopedia. Jagged silver fabric measures 1” across; letter measures 8.5” x 11”. Near fine. Sold for $1,875. Charles Lindbergh Spirit of St Louis fabric. Click to enlarge. Charles Lindbergh autograph letter signed, dated 22 November 1927, only six months after his historic transatlantic flight, to Richard Blythe and Harry Bruno. Bruno and Blythe handled public relations for Lindbergh’s New York to Paris flight on 20-21 May 1927. Handwritten three page letter reads in full, ”…Now that my affairs have quieted down somewhat, and I have a little more time to devote to writing, I want to thank you both, once again, for the assistance you gave me both in the preparation of my flight to Paris and after my return to New York. The efficient manner in which you handled things during this period is something which I deeply appreciate. I have watched with interest your publicity work in relation to the aeronautical industry. Conservative, straightforward, publicity will aid greatly in its progress in addition to acquainting the public with actual facts relative to aeronautics…” Each 8” x 10.25” page is affixed to a backing board measuring 8.5” x 11.25”. Minor toning along the edges, else near fine. Sold for $3,175. Charles Lindbergh November 1927 Autograph Letter Signed. Click to enlarge. 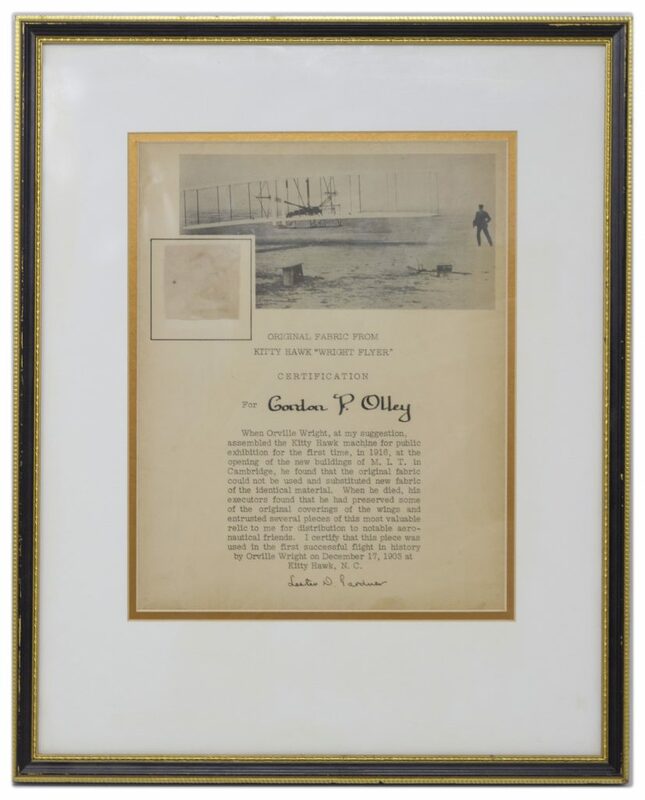 Charles Lindbergh signed sepia-toned photo, dated 19 November 1930 with the border inscribed by the feted aviator: ”To Gilbert G. Budwig, Sincerely, Charles A. Lindbergh, 11/19/30”. Matte photo measures 11” x 14”. A faint imprint of another signature by Lindbergh is present between the lines of the inscription, likely a showthrough from an item signed atop this one. Overall in very good to near fine condition. Sold for $2,218. Charles Lindbergh Signed 11” x 14” Photo. Click to enlarge. 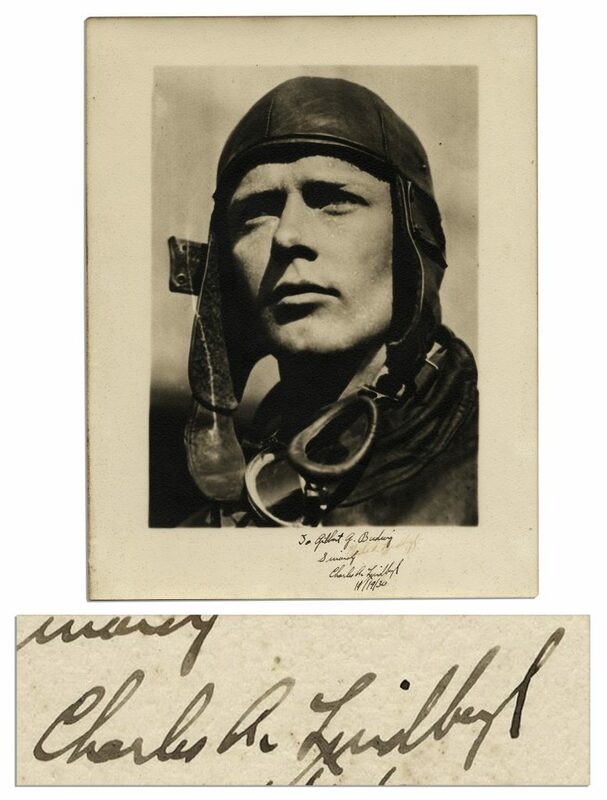 Exceptional Charles Lindbergh signed photograph, circa 1930’s, depicting the aviator in a one-man plane. 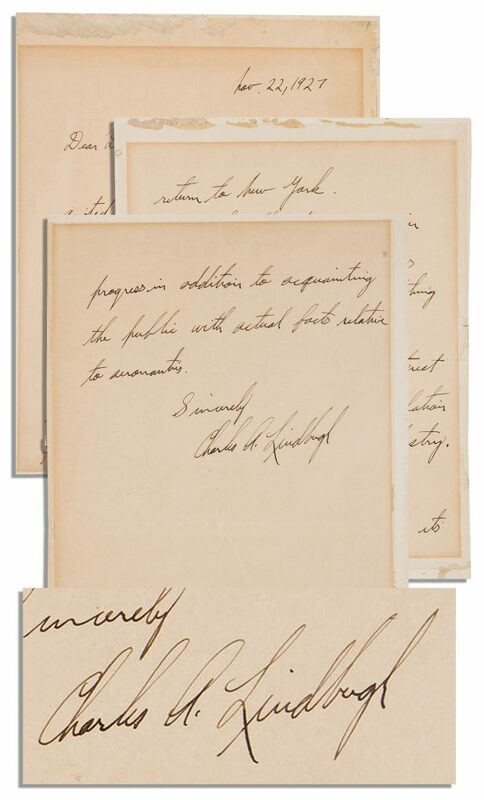 Signed and inscribed in black ink: ”To Mr. Cheney / Sincerely / Charles A. Lindbergh”. Photo measures approximately 9” x 8” with ”Underwood” photo studio copyright at lower right. Left and right margins trimmed, else near fine condition. Sold for $1,563. Charles Lindbergh 9” x 8” Signed Photo. Click to enlarge. 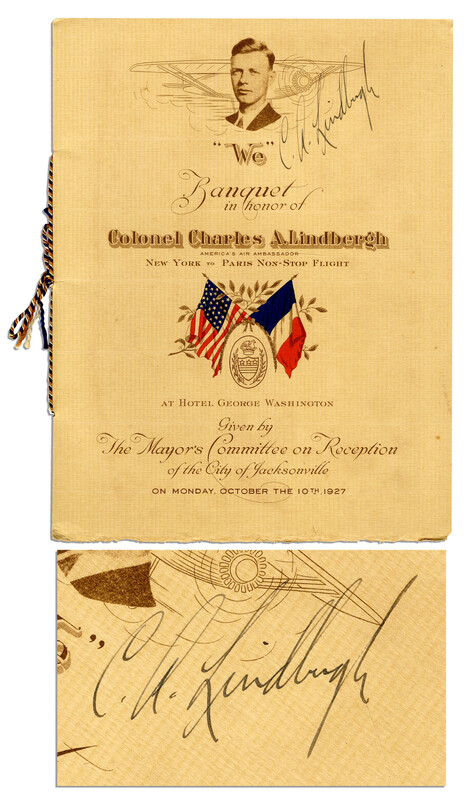 Charles Lindbergh signed program for a banquet in his honor in Jacksonville, Florida, dated 10 October 1927. Lindbergh, who completed his historic New York to Paris flight in May of that year, signs, ”C.A. Lindbergh” next to his image on the cover of the program. The cover also features a line drawing of his plane, the Spirit of St. Louis, and the word, ”We,” referring to his book about his transatlantic flight. Upon his return to the U.S., Lindbergh embarked on a three-month tour around the country, flying the Spirit of St. Louis from city to city. Jacksonville was one of the last stops before the tour ended in October. Lot includes three matte photos of Lindbergh and his plane; two are 5.5” x 7.5”, the other 7” x 9.25”. The eight-page program, bound with red, white and blue cord, measures 8.5” x 11”. Slight soiling to cover, else fine condition. Sold for $1,343. 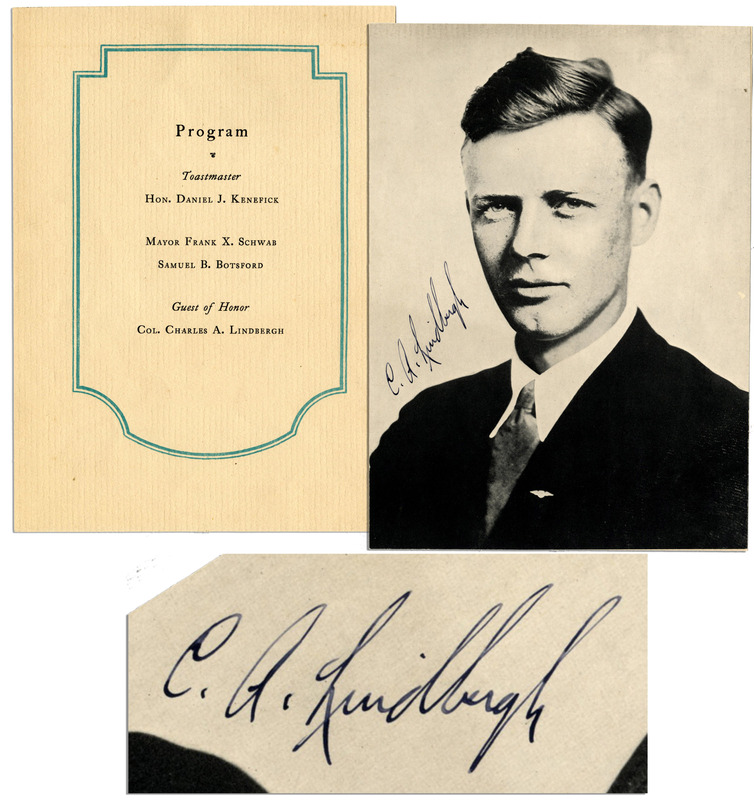 Charles Lindbergh Signed Program — From 1927 National ”Lindbergh Tour”. Click to enlarge. Charles Lindbergh carbon copy of his application for his Airman Medical Certificate. Most interestingly, under ”Total Pilot Time / To Date,” Lindbergh has written ”7000” (Civil) and ”1000” (Military) and, ”17” (Civil – in Last 6 months). Carbon copy of the application filed by Lindbergh at the Federal Aviation Administration. Here, he fills out various personal information in his hand, including his full name, ”Lindbergh Charles Augustus”, his Darien, Connecticut address, Social Security No., Date of Birth ”2/4/02” Other information filled out by Lindbergh include Height in inches ”74”, Weight in pounds ”185” Color of Hair ”Gray”, Color of Eyes, ”Blue” Occupation, ”Consultant”, Employer, ”Self”, and Length of Time in Present Occupation, ”43 Years”. On verso, filled out in pencil (not a carbon), is his ”Report of Medical Examination.” It is not signed by the Aviation Medical Examiner and was undoubtedly copied by a medical assistant from the actual application filed with the FAA. Includes: ”Hearing Right Ear 20/20 ft. Left Ear 20/30 ft…Distant Vision Right Eye 20/30 corrected to 20/20, Left Eye 20/200 corrected to 20/20, Both Eyes 20/30 corrected to 20/20.” Near Vision has been corrected to right eye 20/20, left eye 20/20, both eyes 20/30. Sold for $1,250. 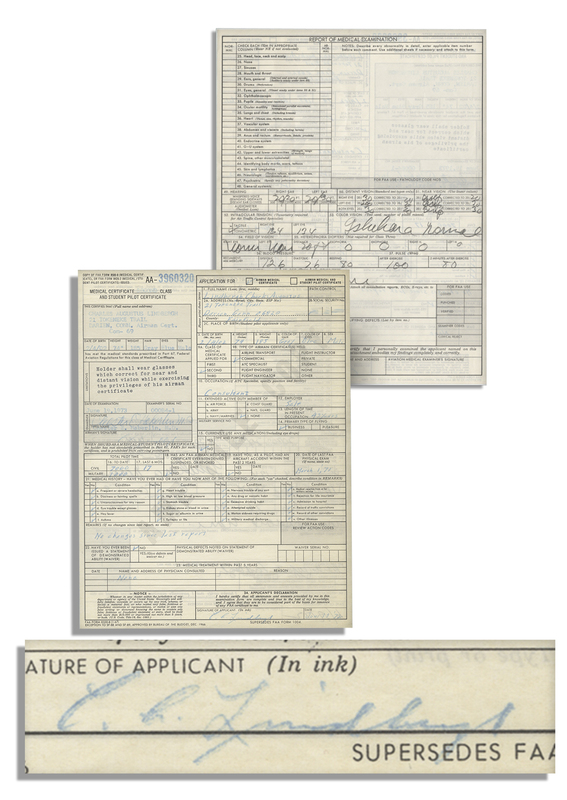 Charles Lindbergh Application for His ”Airman Medical Certificate”. Click to enlarge. Charles Lindbergh signed portrait on a 1920’s event program. Lindbergh became a worldwide celebrity after flying solo non-stop across the Atlantic Ocean in 1927. This two-sided program, from a Buffalo, New York event honoring Lindbergh, features a portrait of the aviator on one side, next to which he signs in black ink, ”C. A. Lindbergh”. Measures 6.75” x 9.5”. Near fine. Sold for $954. Charles Lindbergh Signed Portrait. Click to enlarge. 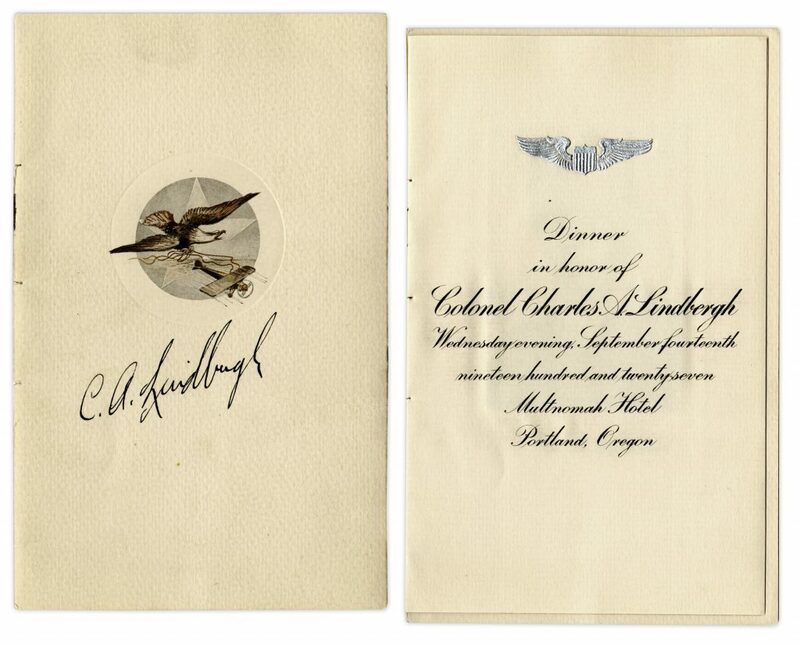 Charles Lindbergh signed program, for a dinner held in his honor on 14 September 1927. Lindbergh elegantly signs ”C.A. Lindbergh” to the cover, underneath an illustration of an eagle attached to a plane. Four page program also features the events of the ceremonies, a small black and white portrait of Lindbergh and a dinner menu. Measures 5” x 8”. Near fine. Sold for $938. Charles Lindbergh Signed Program From Celebratory Dinner. Click to enlarge. 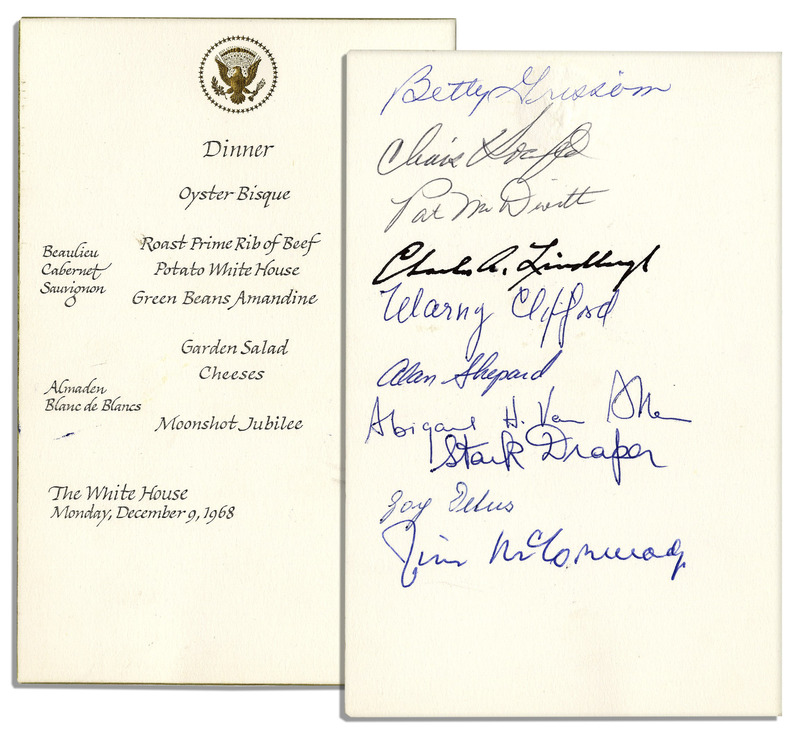 Presidential menu from a dinner held at the White House in 1968, with verso signed by ten guests including ”Alan Shepard” and ”Charles A. Lindbergh”. The other signatures are by Betty Grissom, wife of astronaut Gus Grissom; Abigail Van Buren of Dear Abby fame; Pat McDivitt, wife of astronaut James McDivitt; Joy Debas, wife of a prominent scientist; and Air Force One pilot Stark Draper. Menu features a gilt presidential seal at top center and all edges gilt. Measures 4.25” x 6.5”. Scattered minor ink marks to menu, else fine. From the collection of Gus Grissom’s son. Sold for $938. The First Men of Aviation & Space Together. Click to enlarge. 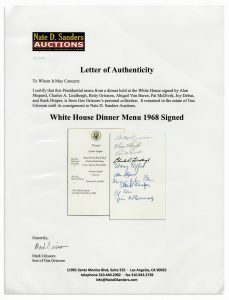 LOA for White House Dinner Menu Signed. Click to enlarge. Charles Lindbergh signed first edition of ”We”, published by G. P. Putnam’s Sons: New York: 1927. Frontis photo page is signed, ”Charles A. Lindbergh” in dark blue ink. The lauded aviator’s account of his groundbreaking transatlantic flight and personal background is photo-illustrated and runs 320pp. Bound in cobalt blue cloth boards with gilt lettering and airplane design. Endpapers feature an airplane pattern. Measures 5.5” x 8.25”. Toning to leaves and edges, wear to board corners and edges and detached signed leaf, else near fine. Sold for $938. 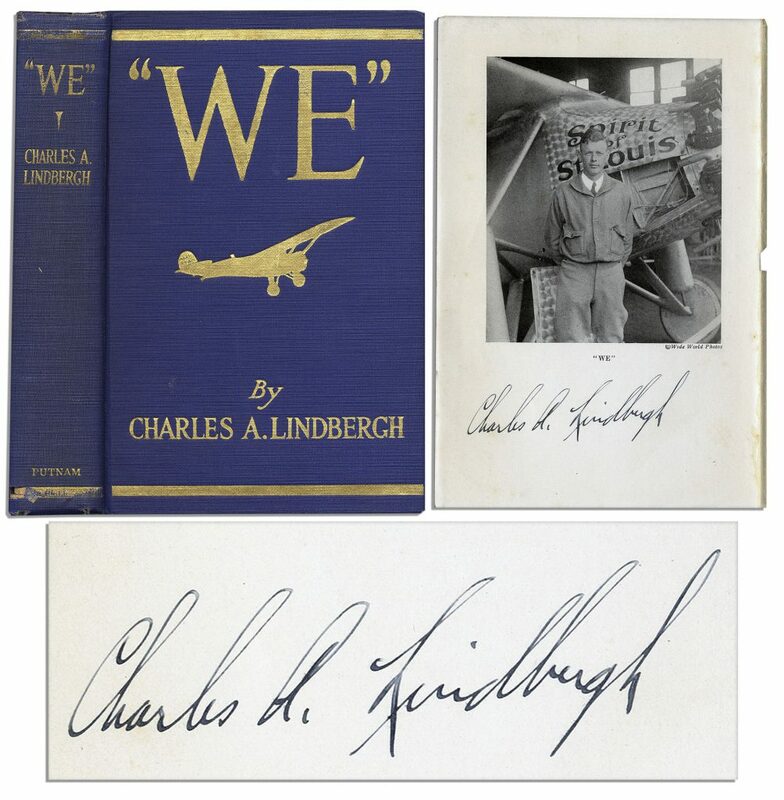 Charles Lindbergh Signed First Edition of ”We”. Click to enlarge. 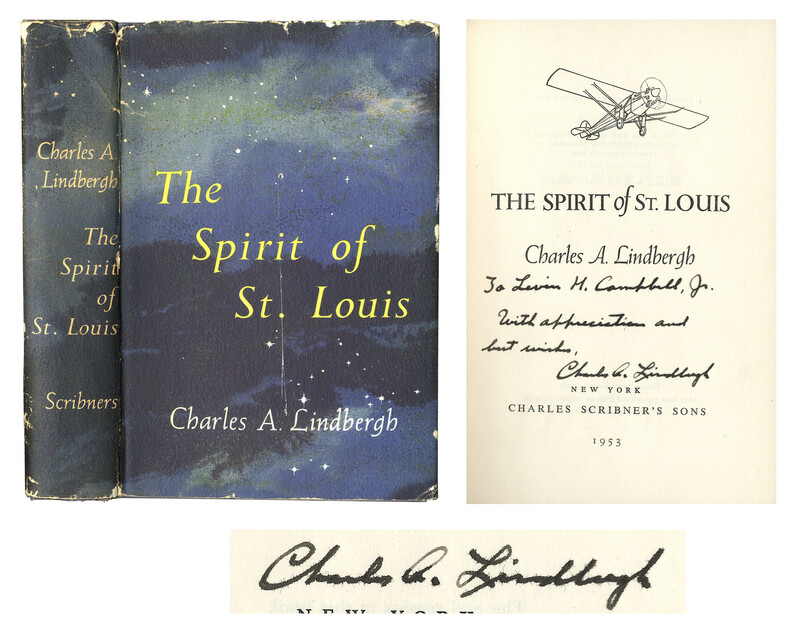 Charles Lindbergh signed copy of ”The Spirit of St. Louis”. New York: Charles Scribner’s Sons, 1953. First edition, later printing. The extraordinary aviator inscribes the title page to WWI General Levin Campbell, Jr.: ”To Levin H. Campbell, Jr. / With appreciation and best wishes, Charles A. Lindbergh”. Lindbergh won the Pulitzer Prize for this account of his successful attempt of the New York – Paris flight that had claimed the lives of six pilots before him. Runs 562pp. Bound in blue cloth boards with silver lettering, book measures 5.75” x 8.5”. Dust jacket is lightly chipped, overall in very good condition with $5.00 price intact. Book is very nicely preserved, in very good plus condition with light shelf wear. Interior and signature page are near fine. Sold for $750. Charles Lindbergh 1953 Signed Copy of ”The Spirit of St. Louis”. Click to enlarge. 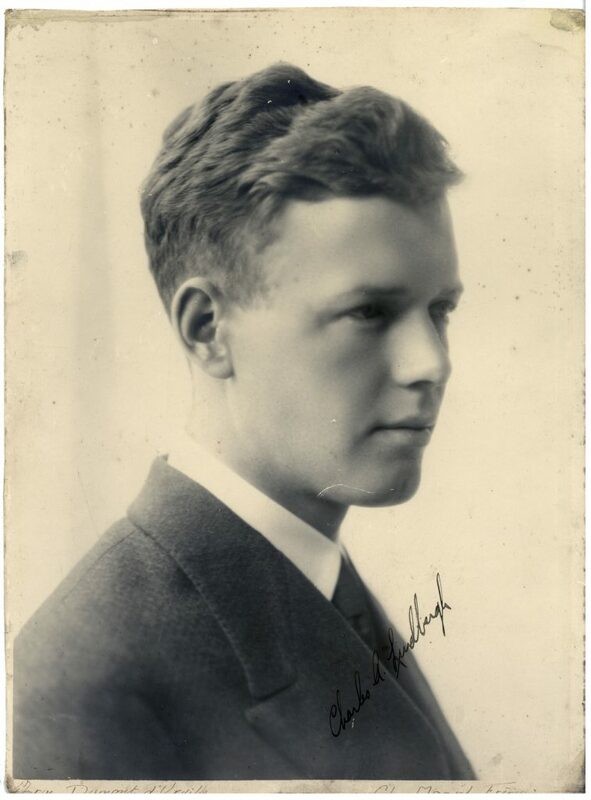 Sensitive signed portrait of aviator superstar Charles Lindbergh as a young man. 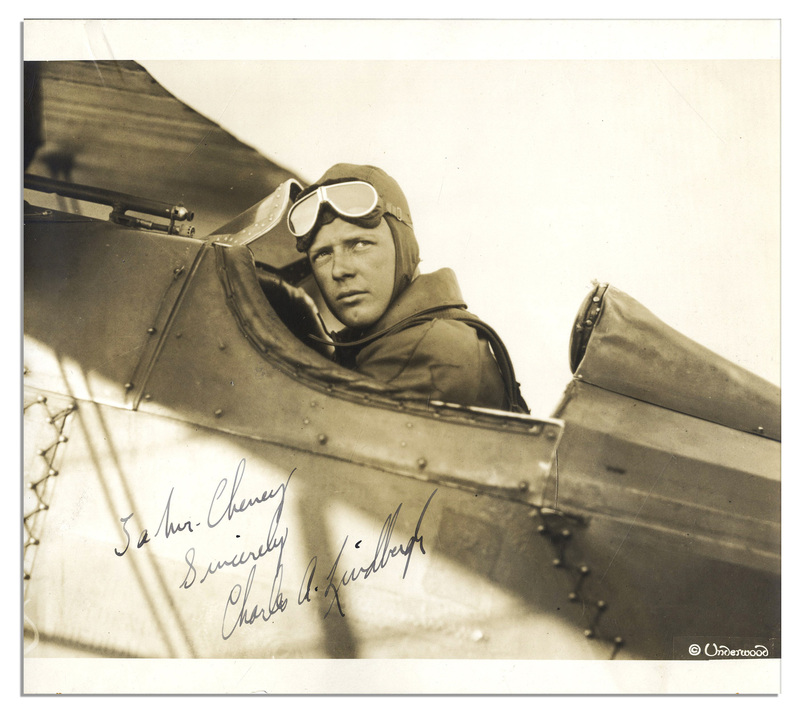 8” x 11” matte photo is signed by him in black fountain pen, ”Charles A. Lindbergh”. Photo is mounted to cardstock. Light spotting, discoloration along edge, discreet scratch on chin and unevenly trimmed border, none of which overpower the image. Overall a compelling photograph in very good condition, boldly signed by Lindbergh. Sold for $750. Charles Lindbergh 8” x 11” Signed Photo. Click to enlarge. Charles Lindbergh signed postcard featuring an attractive photo of him above his plane, the ”Spirit Of St. Louis” that he flew solo from New York to Paris in 1927. Signed ”Charles A. Lindbergh” in green ink below the printed name. Card measures 5.5” x 3.5”. Near fine. Sold for $726. 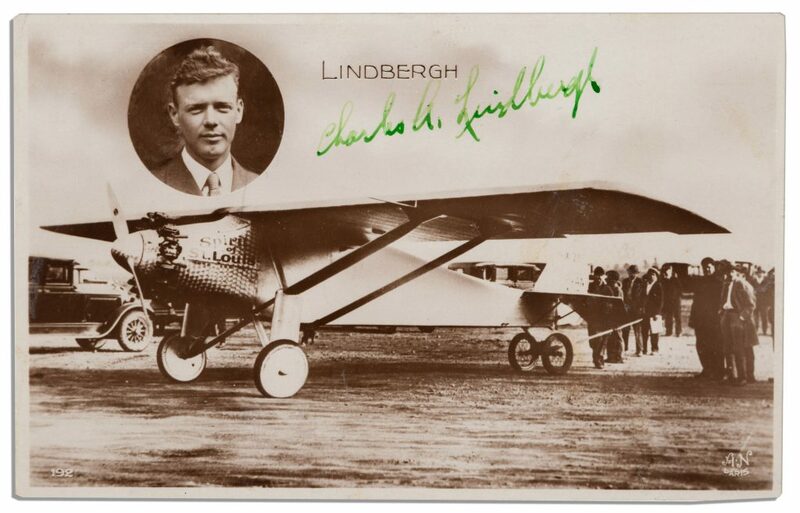 Charles Lindbergh Signed Postcard. Click to enlarge. Legendary aviator Charles Lindbergh signed copy of ”Lindbergh of Minnesota”, a political biography of his father written by Bruce L. Larson. New York: Harcourt Brace Jovanovich, 1973. The book chronicles the political views of Lindbergh’s father, who was a progressive Republican congressman from Minnesota. Lindbergh and the author both sign the title page, with Lindbergh boldly signing ”Charles A. Lindbergh, Jr.” in black ink. 363pp. hardcover book is bound in blue cloth boards and has original, unclipped dust jacket. Measures 5.75” x 8.5”. Small chip to jacket, else near fine. Book itself is near fine. Sold for $625. 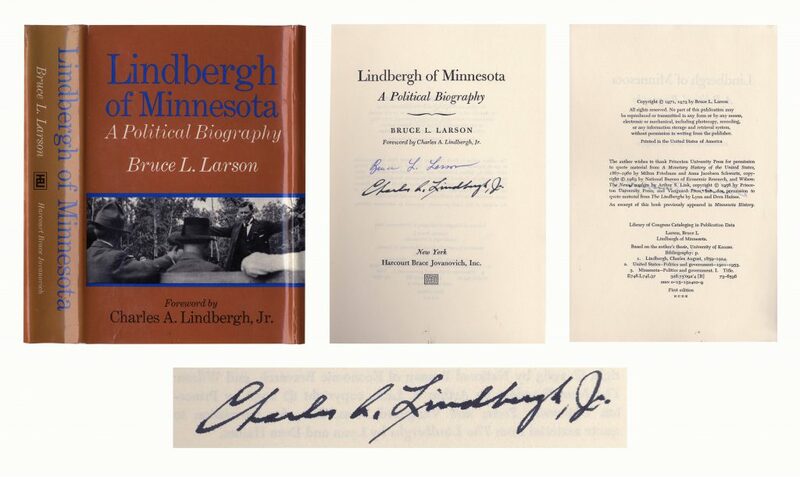 Charles Lindbergh Signed Copy of ”Lindbergh of Minnesota”. Click to enlarge. Please let us know if you have Charles Lindbergh Spirit of St Louis fabric or other Charles Lindbergh memorabilia for sale. Top dollar obtained for your Charles Lindbergh Spirit of St Louis fabric.